I am always looking for the "next best thing" when it comes to foundations. Even though I have an assortment of reliable foundations that work well for me and do the job, the foundation aficionado in me finds it hard to turn away from trying out more-especially, those that are new on the market. 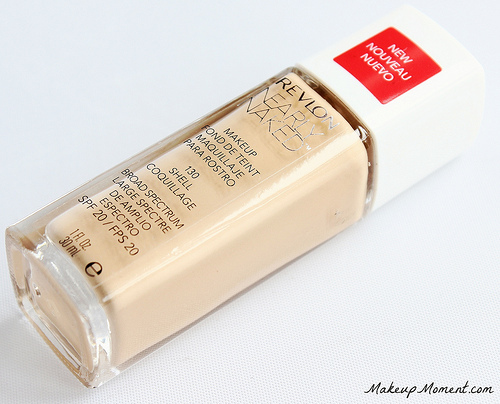 A little over a month ago while shopping at CVS, I stumbled upon Revlon's latest foundation-Nearly Naked ($9.99). This foundation contains an SPF of 20 and sets out to provide even, buildable coverage, that blends seamlessly into the skin without feeling heavy or giving off a cakey appearance (source). Revlon's Nearly Naked definitely sounded like something that was right up my alley, so of course I had to pick up a bottle to try out for myself. And let me just say, I am not disappointed. In fact, Revlon's Nearly Naked may just be one of my newest favorite drugstore foundations. 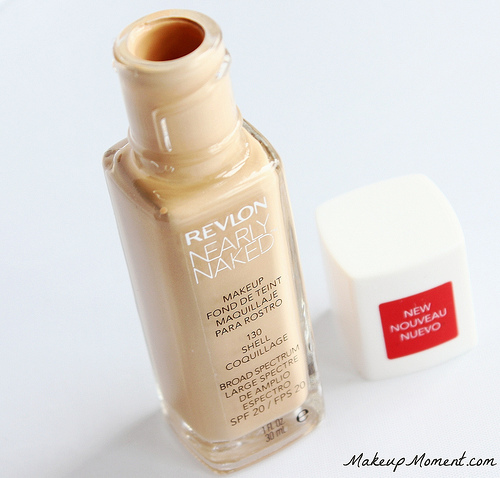 Revlon's Nearly Naked Foundation comes housed in a sleek glass bottle. Although I like the simplistic look of the glass bottle, I really do wish that it would have contained a pump of some sort. A pump not only allows for product distribution control, but it also lessens the mess factor-which is pretty inevitable with this bottle. Ugh. When it came down to the shade selection, I went with shell, which actually turned out to be a pretty nice match for my NC25 skin tone. In the bottle, the color looked to be mostly on the neutral side, but I was pleasantly surprised to see that it also contained a bit of a yellow tint, that compliments the yellow in my skin perfectly. 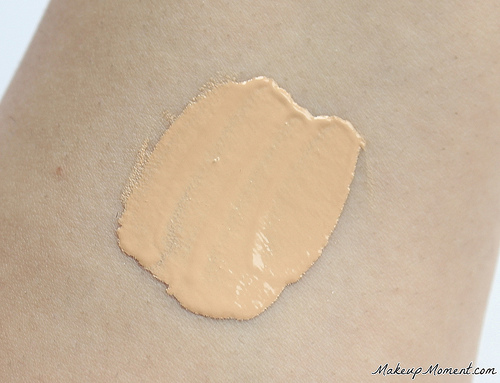 The consistency of the foundation is very creamy, albeit thin, it's not runny. This foundation blends onto my skin effortlessly, it feels lightweight on, and I love that this doesn't enhance pores or cling to dry patches. Nearly Naked doesn't set right away, so you have a lot of time to work with it before it does. Coverage-wise, I would say this is light-medium buildable. For the most part, one layer is enough for evening out skin tone, and blurring out small imperfections like acne scars. But personally, I like a bit more coverage. For extra coverage I add a second layer of this foundation, and dab on some concealer to hide those stubborn spots that peek through. If you are fond of a radiant, satin finish, this foundation will deliver. I find that after application, my complexion looks so much healthier, in a natural looking way. It's almost like a "my skin, but better" sort of thing. Lasting power is not too bad. For the most part, Revlon's Nearly Naked foundation holds up well on my skin, with very minimal fading by the end of the day. But I do notice that it starts to break down a bit on the really oily areas of my face like my nose, a couple of hours into wear time. I always make sure to bring along with me a setting powder for those mid-day touch-ups. I have sensitive, acne prone skin and I am happy to report that I haven't experienced any breakouts or irritation from the usage of this foundation. Sweet! Overall: I think Revlon's Nearly Naked foundation is a nice option for drier skin types. It gives the complexion a natural looking, healthy, moisturized appearance that I am sure will be very appreciated. I wouldn't recommend this foundation if your skin is on the oilier side, as this quickly breaks down on oil-prone areas. My skin gets unbelievably oily in the summer so I don't think this foundation will be good for me then. But this is for sure going to be one of my preferred foundations come fall/winter, when my skin goes through that never-ending, unbearable super dry phase. What do you think of Revlon's Nearly Naked foundation? Hey Jen, I have enjoyed a nice selection of Revlon's products myself. I really like their lip butters!